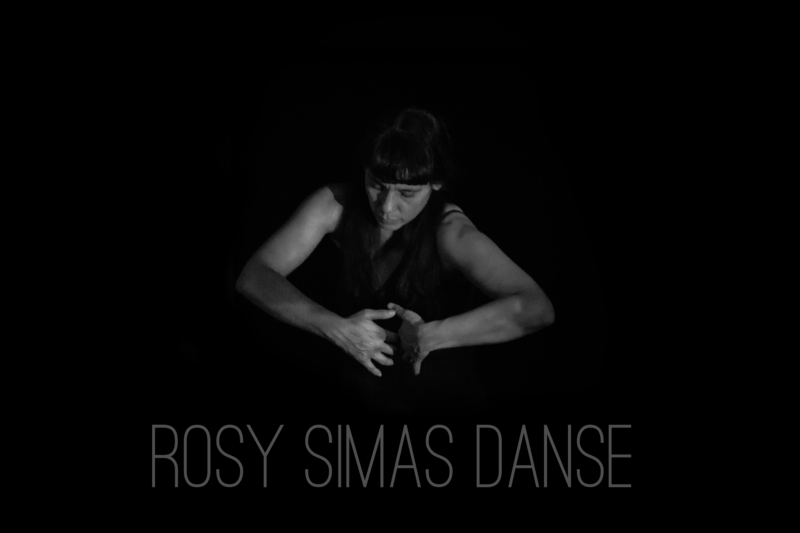 ROSY SIMAS DANSE at Dance Place by Luella Christopher – The Dancing in the District Blog! Posted on May 19, 2015 May 20, 2015 by IsItModern? “We Wait in the Darkness” by Rosy Simas is tender, wracked with catastrophe and yet life-affirming. Through the many disciplines of dance, sound, image, art, nature, poetry and history, Simas in a one-woman performance demonstrates how the displacement of her Seneca ancestors from their Allegany reservation in western New York State over three centuries ago affected generations of her family members. Powerful memories remain in her body and guide the manner in which she moves. The opening set gives the audience three panels to ponder; these will serve as screens for slide and video projections. A white dress – perhaps a graduation or wedding dress – hangs in suspension from the ceiling upstage and eventually rotates on its own axis. Simas begins the piece by sitting low with her back to the audience for an extended period. She is nearly naked and barely moves for a lengthy segment in which hands behind her back converse with the audience to the recorded sounds of her family’s endangered Seneca language. A single clock ticks, suggesting the passage of time. Simas crawls, looking backward as a large panel shows a projection of an old clapboard house, which is then zoomed in on the window. She puts on the dress and lies in front of the house, the lighting creating a rainbow on her skirt. Simas’ movements are both contained and expansive: circles with the leg and foot in a motion that could be described as “churning butter”, walks in parallel with feet turned in and toes curled upward, a leg poking out from under her dress almost like a bird. As she moves through the most deliberate port de bras I’ve seen recently, the projections turn to a forest, then a group of ancestors (mostly female), finally a field. Improvising with her arms and hands, Simas alternates slow with punctuated moves. Suddenly we hear multiple clocks, unsychronized, that suggest even more passage of time. In one of the work’s strongest repetitive gestures, she slashes her arm horizontally across her body at neck level – both in real time and superimposed on the panel projections. Sounds of a thunderstorm erupt. Simas falls to the floor, legs parallel and feet flexed. The pace picks up, then stops abruptly. Projections show water, map, house, lake, image of a wizened ancestor. Simas dances throughout rumbling sounds and double projections. In one particularly powerful scene, she stands and walks through projections of waves but never drowns. The ground in the projections breaks apart like an earthquake – first in half, then in thirds. Sleet engulfs the forest. The scene is frightening and we yearn for word of the fate of those living on the Indian reservation as if these disasters had occurred yesterday. Program notes explain that a 1794 treaty between the United States and the sovereign Six Nations of the Haudenosaunee was breached by the national government in order to build the Kinzua Dam and create the Allegany Reservoir. Depicted dramatically in the videos, the dam broke the trees and flooded part of the reservation as well as the entire Cornplanter lands where Simas’ grandmother was born. Amidst the recollection of these horrific events, a regenerative lightness of being emanates from the recorded sound score. “I used to speak Seneca but only know the dirty words now”. And, “If there is someone you don’t like, be extra kind to them that day”. Despite the pain of losses flowing through the generations, this matrilineal society of strong women gradually learns to forgive. Simas returns to the stage dressed in black pants and top. She cups her hands and fingers, blowing on them as if planting seeds or warding off the cold. The relocation map created by the U.S. Corps of Engineers reemerges in real time with demarcated plats and subdivisions. (The original map may be viewed at the Museum of the American Indian in D.C.) In another extended sequence, Simas meticulously tears off sections of the map along black lines, places them around the stage and even hands individual sections to members of the audience. Fragmentation of the native Seneca lands could hardly be more graphically portrayed. Now Simas is silhouetted against projections of giant ferns to the sounds of whispering voices in the Seneca language. The woman in headdress is her great grandmother or great-great grandmother. Again, after blowing into cupped hands, Simas walks offstage. Left stunned by the poignant statement she has made, the audience is slow to rise and leave the theater. Soundscapes and surround spaces by Francois Richomme are keyed to Simas’ exploration of the manner in which the body stores history, homeland and identity. A musician, sound engineer and sound designer trained in contemporary dance, Richomme displays extraordinary sensitivity for the notions behind Simas’ multifaceted art. In addition to recording people, rivers, wind, forests, wildlife on the Seneca land, he integrates the “rare and precious” musings in the endangered Seneca language to render a compelling portrait of memory and presence. The letter is read by Laura Waterman Wittstock, a native of the Cattaraugus Seneca Indian Territory. Karin Olson and Carolyn Wong created the original lighting designs that are realized by Dance Place’s own Ben Levine. The set was designed by Simas with contributions from Steven Carlino and Francois Richomme. This dedicated crew provided the Dance Place audience with a priceless evening of dance theater that will be long remembered.